The invitation by Sir Eric of the original Wood Nymph came at just the right time. Having mostly been to their SM counterpart (just similar names now, they’re totally under different management) for convenience in recent years, the visit to Baguio’s first ever Korean restaurant refreshed my memory and I remember how I always had it good at Military Cut Off. (“,) The kids at the academy I went with before never just had samgyupsal. They had a variety of taste explosions. Just like in those visits years ago, our host recommended to us their best sellers, the favorite of their Korean patrons. Lots of space and lots of tables at Woodnymph Military Cut Off, wee! Before I even had time to closely inspect and get drool-y faced over the high quality photos lining one side of the dining area, I had to go back to our table because lunch was ready. Whoa, that was a fast prep. \m/ I hurriedly walked from the other end of the dining area (expanded from the previous years) to the other end where our table was. Sundubujjigae starters. Don’t be fooled by that bubbly red orange liquid bowl of soup in the photo above. Underneath all that boiling spicy broth of soondubu, the egg dropped in it has already cooked through. Stuck to the egg are tons of shellfish, scallions, and soft silken tofu. =D When I scooped some of the chigae into our little bowls, there were tons more that swished away from the serving spoon. Breathing through our mouths now because of the hot food, hot in every sense of the word, temperature wise and taste wise, Woodnymph wasn’t done wowing us yet. *hihi The bossam needed a few more minutes to be prepped. Though I was pretty happy having my chopsticks in whatever was laid out for us at the moment. 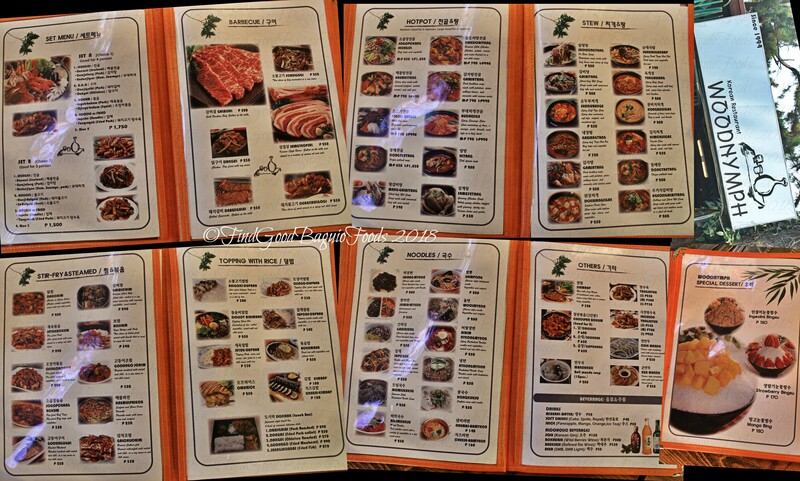 If you don’t like to dine a la carte at this Korean resto … what’s wrong with you? *tahaha I’m kidding. If you don’t like to dine a la carte because you’re in the mood for a food fest, a grilling buffet for lunch, 10:30 a.m. to 2:00 p.m. and dinner, 5:00 p.m. to 9:30 p.m. is also available at Woodnymph MilCut for P399 per person. Korean buffet with grilled meats, japchae, kimbab, mandu, tangsuyuk, doenjang jjigae and side dishes. It’s complete with all the side dishes (kimchi, cubed veggies salad, sweetened marble potatoes, a miyeok/seaweed side dish, and even lumpia bites), the condiments (besides the regular ones, they have wasabi and a finishing salt mixed with pepper), and additional viands (kimbap, japchae, tangsuyuk, mandu, and deonjang soup ❤ ❤ ❤ ) one could ever want so you won’t be stuck with a monotonous mouthful of just grilled meats (which by the way, they keep to its freshest in a nice little thingamajig that keeps the meat cool even while it’s on display). Samgyupsal, beef bulgogi, pork bulgogi, chicken kept fresh and chilled in this gizmo. Oh man, the evening Chef Kevin, Sir Albert, and X+1 came here for buffet, I zoned in on the soup. I couldn’t count how many bowls I consumed. More ❤ ‘s for deonjang jjigae! As it was years back, X still marks Woodnymph for good food in Baguio. And if you go the extra kilometer to Military Cut Off, everyone here will go the extra mile and then some to make your Korean themed meal, be it buffet or a la carte, a memorable one. ***Thank you for the refresher on the best of Korean dishes, Sir Eric! Race and I really enjoyed our mealtime at the original Woodnymph Korean Restaurant. See you again soon and more power! Sangkatus na ang Korean buffet buffet chuvaness ha. Pang ilan na ditey sa original Wood Nymph? Meron din bang Korean costumes ditey? Hello, Carol! Yes, Baguio’s pioneer Korean restaurant, Woodnymph Military Cut Off is just there, growing and improving through the years. Oh and just an extra infobite for you, this Wood Nymph resto and the one in SM are no longer affiliated. Do check the Original Woodnymph out if you happen to find yourself on Military Cut Off Road. I had forgotten about Woodnymph. Tnx for your informative blog, my family and I will revisit this Korean restaurant soon. Hello, Alysa! Just to many restaurants in food trip city, Baguio City, it’s hard to remember every one unless we pass by it or remember memories from them. Ahem. Sundobujjigae is my favorite Korean dish!